Her hand on the globe symbolises her power. The Plantations have a reputation for being the most boring part of the History course. They are (hopefully) the first topic you'll look at and ask "why does this matter?" It can be very hard to figure out why you need to learn about the Plantations, but it's only in 3rd year that their importance to Ireland today becomes obvious. In 3rd year, you'll learn about Northern Ireland. You'll learn why Ireland was divided, why there was a struggle there for decades, why the Troubles began, and why there was so much fighting between republican groups (the IRA etc.) and loyalist groups (the UVF etc.). You might know already that one of the biggest problems in Northern Ireland was that the Catholics and the Protestants were nearly always against each other. Protestant unionists held the power in Northern Ireland for decades, and they discriminated against the Catholic people living there. The origin of this story (like a prologue in a book) is the Plantations. You've seen how the Reformation changed the religion in most of England to Protestantism. Now, English Protestants are being sent to Ireland as "planters" to take over the land for the King or Queen of the day. You learn about three different Plantations in this chapter: Laois-Offaly, Munster and the most important one - Ulster. Ulster is made up of nine counties. Today, six of those counties make up Northern Ireland. Learning about the Ulster Plantation is the first step to understanding the whole history of Northern Ireland. 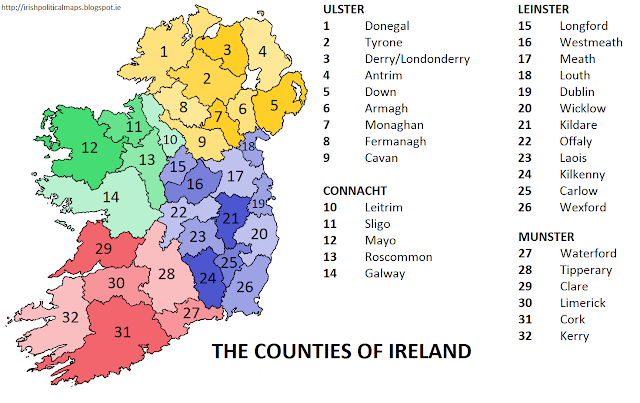 It's a good idea to learn where the counties are for this chapter, especially Laois (23) and Offaly (22). Munster is in red and Ulster is in yellow. Click on the image to make it bigger. What Ireland was like in 1500: Gaelic lords, Anglo-Irish lords, the Pale. 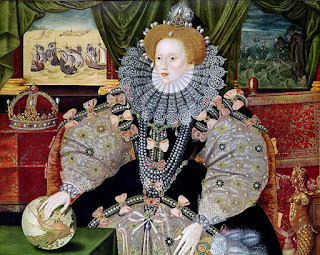 Why the Tudors wanted to conquer Ireland, and how they tried. The Laois-Offaly and Munster Plantations. The Results of the Plantations. A settler who received land in a named plantation. This essay tells the story of the Ulster Plantation, with lots of pictures to illustrate what happened. This site has a feature allowing you to explore a map of Londonderry from the Ulster plantation, showing you where the different merchants settled. Learn about the types of buildings the English introduced to Ireland. Find out which parts of Ulster went to the servitors, which parts to the undertakers, and who got what. Learn more about Cromwell here. Ever used the expression "warts and all"? He's famous for using it.